Introduction: The Sacramento International Sportsmen's Expo is always a favorite event among our staff and a great way to kick off the year by seeing what new products manufacturers have to offer, catch up with professional anglers, and gauge the state of the industry. 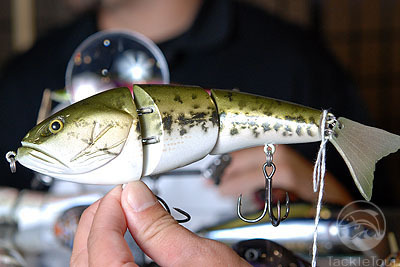 This year the show highlights included custom lure designs, new rod additions, and plenty of tips and techniques from professional anglers. With the reel companies already done with their mid-year introductions the spotlight has now shifted to the rod and lure companies who get creative to launch new products and limited edition models. 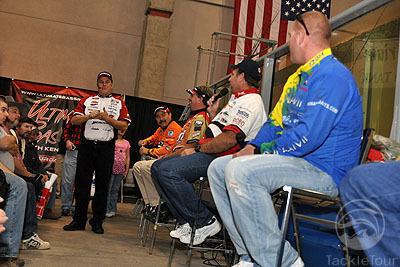 Also at the show was our friend Kent Brown, professional angler and host of the "Ultimate Bass" radio show, who held a informative round table seminar which allowed show goers to ask any question to the pros. 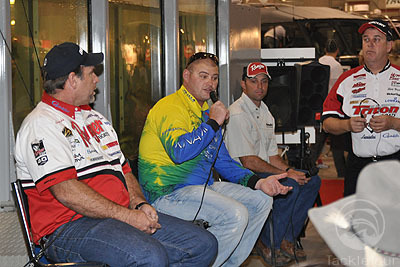 The pros shared their experiences as well as tournament tips and techniques ranging from whether or not they believe scent is effective to whether it makes sense to fish a swimbait when there is money on the line. Attendees that asked questions were rewarded with both quality answers from the pros and free tackle. While the roundtable was going on we head to the many aisles in the fishing hall to find the most interesting products, starting with lures. Tater Hog: Tater Hog isn't known to many anglers but that's all about to change with Jake Bunio of Trophy Bait fame bringing the lures to the western region. 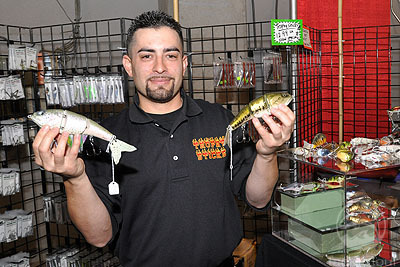 We caught up with Jake who introduced us to the new line of premium handmade baits from Tater. 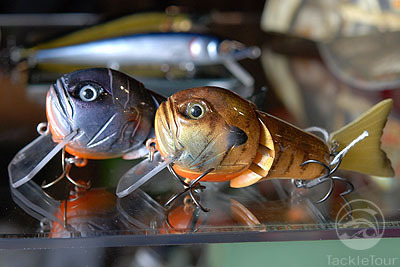 All of these baits are hand made by Matt McBee (A.K.A Tater Hog) and feature distinct "personalities" with carefully sculpted profiles, faces, and incredible paint finishes. Each of these lures are hand made and take over 10-12 hours to paint each! Hoochimomma: Ready for something different? 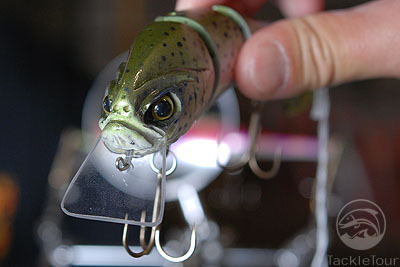 The Hoochimomma is a crankbait with a massive head and comes painted in a wide array of patterns. 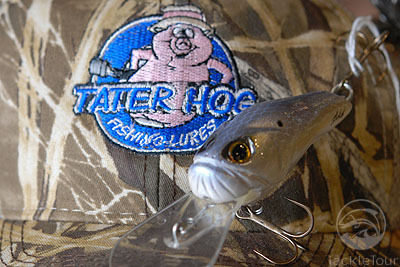 The original Sunfish pattern was our favorite and showcases just how extraordinary the Tater Hog finishes really are. The Hoochiemomma features a jointed body that wags side by side when retrieved and comes armed with a quad hook. This premium lure will retail for $89.95 each. Mad Shad and Grandpa crankbaits: Proving that Tater can paint any pattern there are a slew of different crankbaits and patterns with different looking faces sporting different prey patterns. The Mad Shad and Grandpa crankbaits are smaller more traditional crankbaits with special finishes and will retail for 34.99 each. 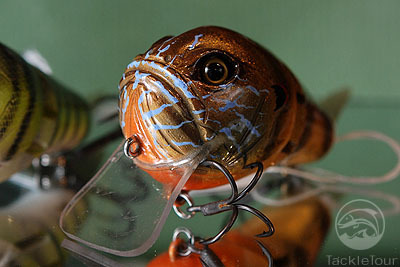 Big Tater Swimbait: Tater also has a number of swimbaits that also feature distinct faces and inimitable paint finishes. These lures are made out of resin and are available in everything from traditional bass and trout patterns to Fire and White Tiger patterns. 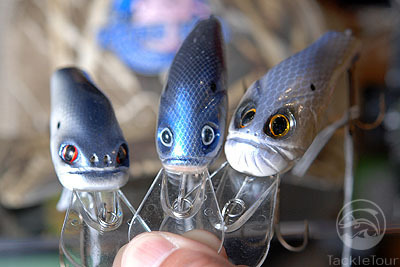 As with all of Tater's lures each swimbait is tested and tuned before they are approved for sale. 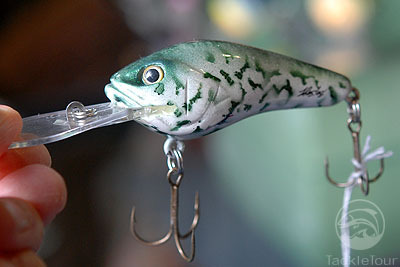 Each of the handmade Big Tater Swimbaits will retail for $125 dollars. Jake will help expand distribution of the Tater Hog baits out west and the company is also preparing to launch a new online tackle store in the next few weeks. For now these lures will be a little tough to come by but judging from their distinctive finishes they might very well be worth the wait. We look forward to seeing what they actually look like in the water.